I was always excited to be the first person awake in the morning during Christmas time. This meant I got to turn the lights on for the tree. This was fine with my parents because the outlet was way back in the corner behind the tree. I had to pull some presents out of the way and slither along the floor under the branches to reach it. I had to be very careful because any careless bumping of the branches would send a cascade of decorations down to the floor. Up unto this year we have had our xmas tree that the gifts go under at our house set up such that the light switch for the room powers the tree. This year we have to plug it in and out from the back of the tree. Not a big deal though since having gifts blocking that would probably also block entrance to the room. Chris, that story sounds oddly funny. Still, I work with electronics on a regular basis. I still play with a Gameboy Advance SP. 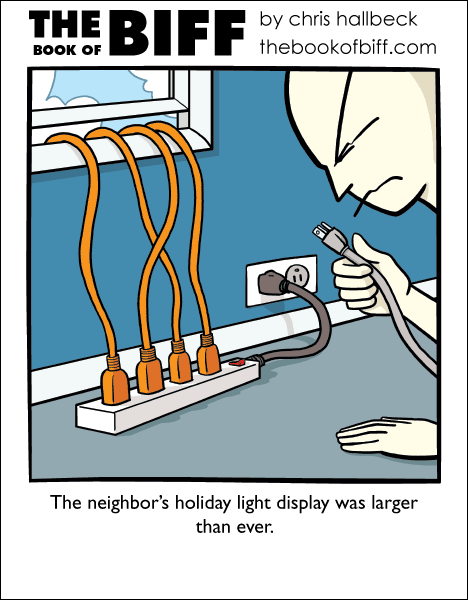 How long before we see his neighbor’s light display on YouTube and from outer space? What? Someone other than Biff is doing something outrageous? Unthinkable! I am done. It took me a while to understand the joke because I expected it to be Biff. The key word in this is “was”, because you know with Biff’s house, his neighbors lights are likely to blow up or turn into bluebirds or something equally likely. I’m guessing Biff will just electorcute himself? Time to hook the high-pot to those intrusive cables, and see what lights up!